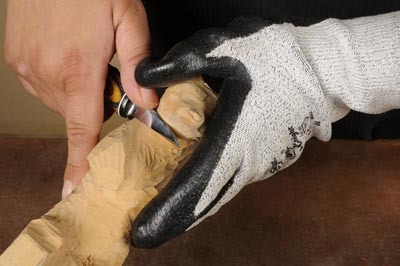 Knife carving is a wonderful way to explore the carving of animals, caricatures and so on, and is easily accessible to people in as much as it requires very little equipment or expenditure, and can literally be undertaken anywhere. You can use any knife that cuts cleanly and allows you to access work properly, but in truth, some knives are designed to make life easier. These two from Helvie not only look good, but have had a lot of thought put into them regarding blade and handle style, how they are likely to be used, and how they cut – a lot different from a modified kitchen fruit knife. For how best to hold the knife for maximum control, the handle is important. 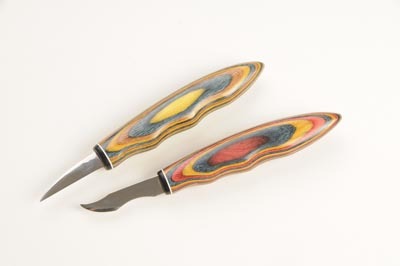 The knives looked at in this test have sculpted – there are sections for the fingers to locate into – multi-laminated and coloured ply handles which not only fitted in my hand well, but Michelle’s too. Both of us tried a variety of holding positions for both aggressive shaping cuts but also gentle refining cuts. Both blade shapes looked at in this test removed timber quickly but can also make the most delicate of cuts. The ‘plain’ blade is the one I used for blocking in the wood and detailing, but since the tip is very fine, I did not want to apply undue pressure on the tip. This is where the curved-bladed knife came into it’s own. The curved edge allows the most delicate of peeling cuts but the blade section and form allows you to also make aggressive cuts in tight to access areas, even with the very tip of the tool. The quality of finish off the tool is determined by the blade sharpness and the direction and angle the blade is cutting the fibres of the wood. Some experimentation is required if one is not familiar with knife craving as to how to get the best cuts and in what direction one should cut, but it doesn’t take long. The blades take an exceptional edge when honed and fit in the hand so well they are a delight to use. Not once did I feel control was compromised no matter what the cut. The handle is well designed and I could not fault the design of the blades or the edge holding quality. At a starting price of $34 they are well priced. The range of knives is comprehensive and allows people to tailor what they buy to what they are making and how they work. They are not only superbly made but also allow the end user various options. Well worth looking at.